People love using iPhone. But as its storage is piled with accumulated data over time, now and then we need to trim the inventory for more spaces. That’s where the regret often happens. You suddenly realize you have deleted some important Pictures, Messages, Contacts, etc., of your iPhone and wondered how to conjure them back. Or you lost all your data inside when your iPhone is crushed, drowned or even stolen. Here comes the helpful iPhone data recovery software PhoneRescue 3, dedicated to retrieving your deleted or lost data at best possibilities. 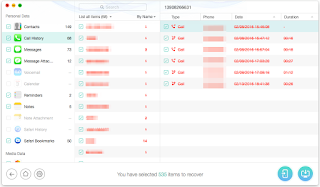 iMobie PhoneRescue3 boasts recovering up 25 data types, which surpasses most competitors among the market – available for Windows and Mac users. Among all, it added the most requested ability to restore essential personal data directly to an iPhone. Meanwhile, it also extends the recovery power to the full iOS by rescuing an iDevice from all kinds of system errors. The interface was clean and straightforward. Three recovery modes and the iOS repair kit were displayed at the above. It worth noting that the general scenarios related to each utility were thoughtfully specified, giving enough references for beginners. For test at the start, I had deleted several pieces of messages, notes, contacts and call logs off my iPhone, then connected it to my Mac and chose to “Recover from iOS Device.” PhoneRescue 3 successfully dug out all the just removed content with fast recovering speed. But you should know that as the overwritten that will permanently erase your deleted data may happen in anytime, the sooner you perform the “recovery from the device,” the better result you may get. PhoneRescue 3 lets you navigate into your iTunes backup and grab out any piece of information inside. Your lost pictures and media files are mainly recovered from here. Personal data like Contacts, Messages, Reminders, Notes and Safari Bookmarks can be directly imported back to your device. 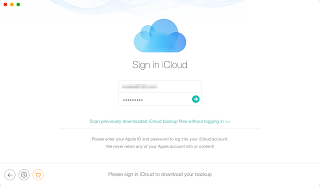 At the start, you needed to sign in your Apple ID to be connected to iCloud. 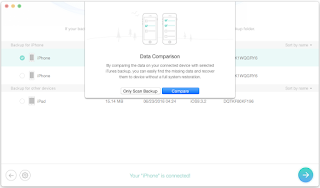 Then all your iCloud backups with size and date were listed. Chose and downloaded your needed backup. The rest process was similar to recovering from iTunes. However, so far PhoneRescue 3 can’t fully support recovering from iCloud with iOS 9. The Windows version of iOS 9.3 can solely recover photos from iCloud, while the Mac version for iCloud recovery is only available for system below iOS 9. This is a new function supporting to fix up a variety of iOS errors like white apple screen, reboot cycle, and black screen. It helps whenever your iPhone runs into failed recovery, upgrade error or jailbreak collapse. 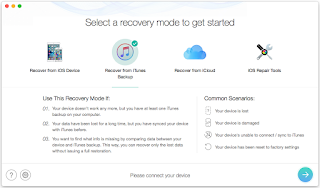 Usually many may suggest a factory reset or iTunes/iCloud restoration when given those problems. But by doing so it will wipe out your iPhone in advance, you may thus lose other data that can never be recovered or restored. 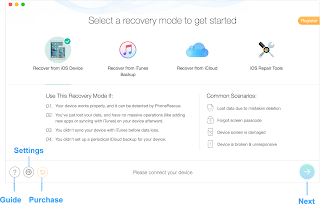 Unlike factory reset and iTunes restoration, PhoneRescue 3 doesn’t remove your current data during the repairing, and meanwhile, update your device to the latest iOS version. So whenever your iPhone breaks down, PhoneRescue 3 worth your bet. 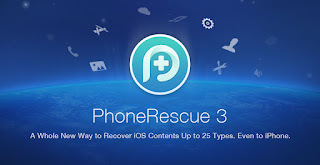 PhoneRescue 3 introduces an innovative shortcut to help you quickly pinpoint whatever is lost on your iPhone when recovering from the backup. It’s helpful especially when small pieces of personal data, like Contacts, Call History, Messages, Reminders, Notes, Safari Bookmarks, are included in the backup but somehow lost on your device. Consequently, as results were enormously narrowed down from the total backup storage to limited options, it’s much easier to spot your needed files since you don’t have to filter numerous options one by one. During the whole review, the process was fast and efficient with accurate recovering result. My iTunes backup was 1.3 GB corresponding to my 16GB iPhone 6s. Therefore if you got a larger device, the time would likely to be added to over 1 minute. It does an excellent job at providing all the necessary functions to find back lost pictures, texts, personal data and even files from third party apps – up to 25 types. 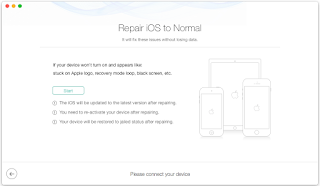 The integrated repair tool also help you fix multiple iOS errors while perfectly preserve the original data inside, making it a preferable system repair method to the proper recovery. I’m looking forward to seeing more new features and making the software even more reliable. Now, you can download PhoneRescue from official website to have a try.